Stuck in a rut and eating the same snacks or meals all the time? Getting a vegan box is a great way to break out of a rut and try new things! Plus, there are vegan beauty boxes now if you want to break out of a makeup rut too. A vegan delivery box might come with food and/or lifestyle products. Read on for my guide to vegan subscription boxes, from snack boxes to beauty boxes and food/recipe boxes. Plus, I’ve included discount codes for as many boxes as possible. If you’re looking for vegan subscription boxes, whether that’s a vegan snack box or a vegan beauty basket, look no further than the comparison table I’ve put together for you below to compare all the vegan box options. Subscription boxes are a great way to try new products you wouldn’t have found or treated yourself to otherwise, and they’re becoming more and more popular. What makes a subscription box vegan? In the case of food, it’s straightforward–they include only plant-based products. In the case of makeup and beauty boxes, they include only cruelty-free products free of animal ingredients. Some also include lifestyle products like vegan cookbooks. I’ve looked into the best subscription boxes (vegan boes only)! Looking for the best vegan subscription box of snacks? I’ve rounded up the best vegan snack delivery boxes below. It’s perfect if you want to try new vegan snacks, while supporting a vegan company (unlike some other companies that now offer vegan snack boxes, but also sell non-vegan boxes, Vegan Cuts only sells vegan food online). 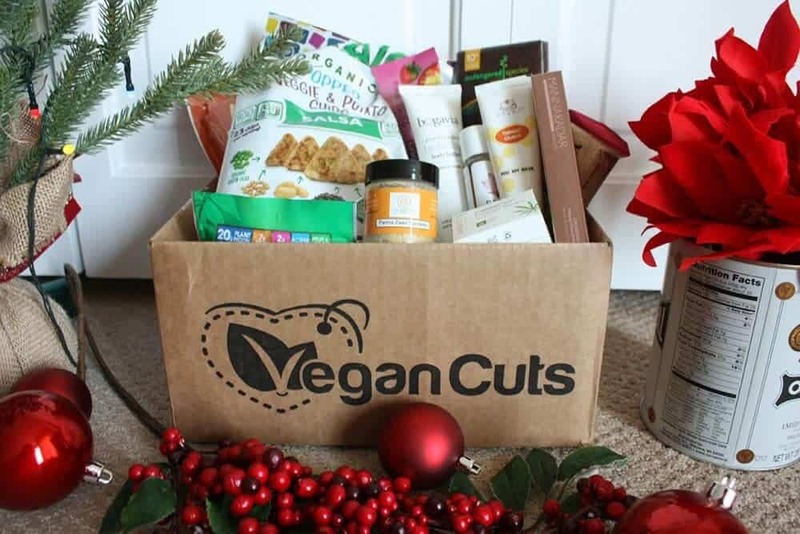 The Vegan Cuts subscription box allows you to try at least 10 vegan snacks per box from vegan jerky to chips to cookies and even drinks like teas and sodas. Looking for a vegan subscription box Canada? Vegan Cuts ships to Canada for $9. Click here to find out more about the Vegan Cuts snack box. Subscription: Select how frequently you want to receive boxes. Cancel or pause orders online. Shipping: Free. Graze is available in US or UK only. Looking for a vegan food box full of healthy snacks? Graze is here to help! Be sure to select the vegan option on the food preferences page. The Graze food delivery box is usually full of dried fruits, nuts and other healthy snack options. One significant downside to the Graze box is the amount of waste it generates, as each snack is portioned into its own box, at least compared to buying larger sizes of snacks in the store. Plus, those plastic film covers aren't recyclable in most places. Discount: Get your first box free--just pay $1 for shipping. Click here to get it and make sure to select the vegan option. The All Around Vegan box is perfect for anyone who wants a vegan selection box but can't make up their mind between food, body care and lifestyle products. The All Around Vegan box has it all! 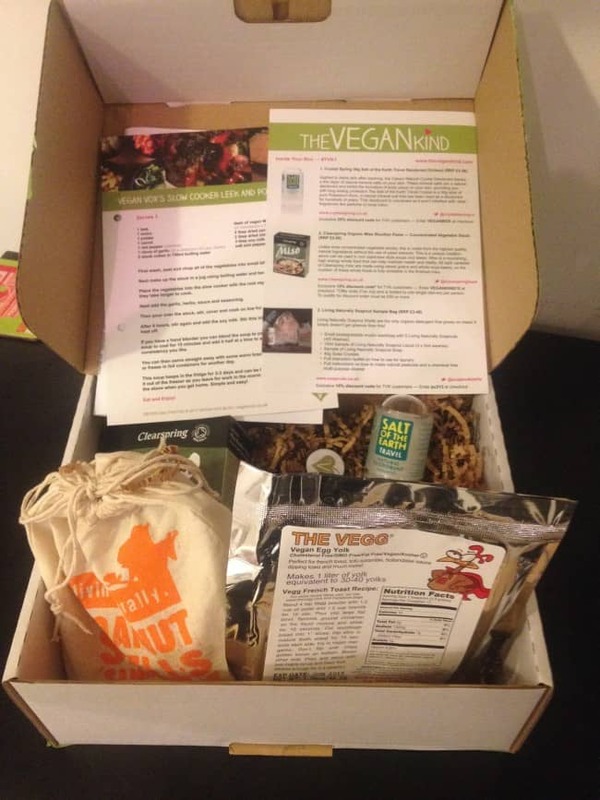 I love the idea behind this box, which is to promote vegan advocacy and activism as well as fit the vegan box subscription bill. Each box contains vegan snacks, a vegan body/bath product and an item for vegan activism. The last could range from a vegan book or a set of chalks and idea for vegan message to write in chalk around your hometown. Products included in the box come from 4 different categories: food, lifestyle, bath/body and activism. As others have noted, one flaw in their system is that they ask you to choose your gender (and their drop-down box includes just 'male' or 'female'). The All Around Vegan box is perfect for the well=rounded vegan who can't choose between a vegan snack box and beauty box, or who wants lifestyle and activism products too! They also have a vegan gift box option. Click here to find out more about the All Around Vegan box. Snack Snack sends healthy, organic and non GMO goodies to your door. Be sure to select their vegan option! 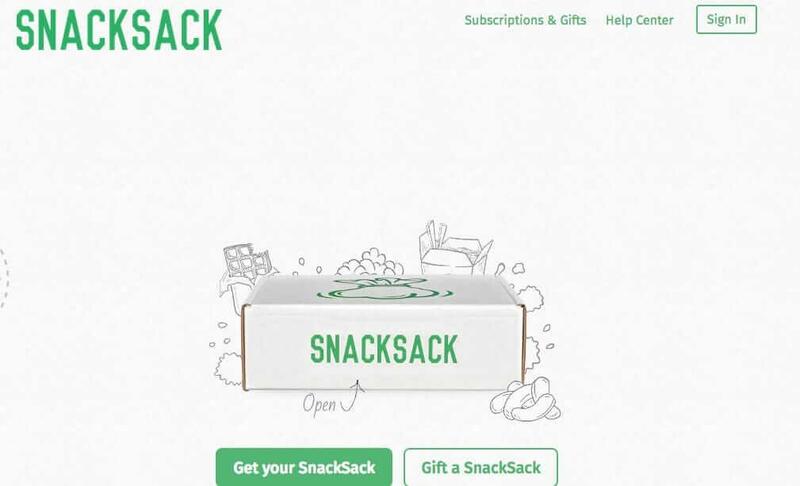 Billing themselves as a healthier snacking option, Snack Sack scours for the best organic vegan snacks to include in their vegan monthly boxes. Their vegan snack packs are filled with snacks that are healthier than what you'd find at the average supermarket, but with more variety than you might find at your local natural foods store. If you love surprises, but want to keep your snacking healthy, then the Snack Sack vegan snack subscription box is for you. Click here to find out more about the Snack Sack vegan snack boxes. The Vegan Kind is the monthly vegan box if you're looking for a vegan snack box UK. I reviewed them when they first came out in 2013 and they're still going strong. The Vegan Kind also has an online all vegan grocery store, perfect if you want to buy vegan snacks online, or you live somewhere you can't easily obtain specialty vegan items (like vegan egg mix) in your supermarket. 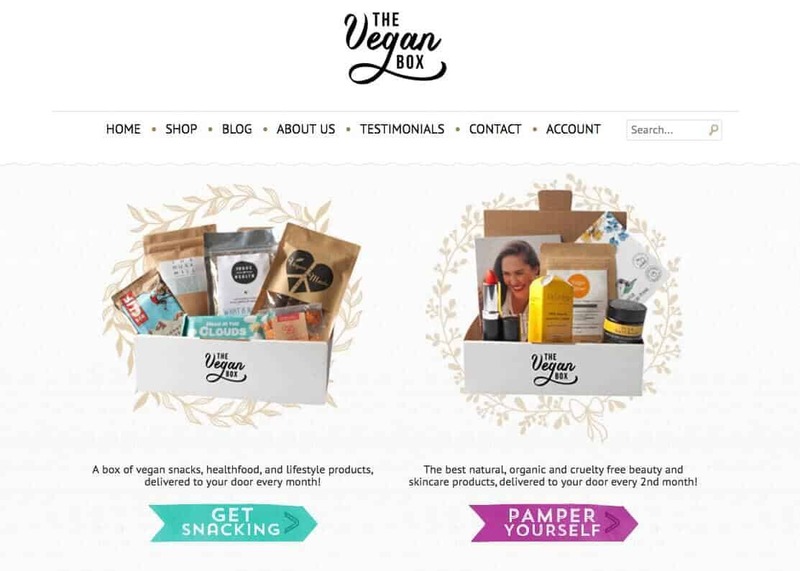 The Vegan Kind subscription box (the lifestyle box) includes 6 to 7 snacks like crisps, chocolate, sweets, nuts and drinks plus one lifestyle surprise, such as a bamboo toothbrush or cleaning spray. Boxes also include vegan recipes. You can choose a gift subscription if you need a vegan gift box UK. Plus, for every vegan box delivery they donate 10p to an animal charity. Discount: Get £5 off with the code 'VEGAN'. Click here to find out more information about The Vegan Kind vegan monthly snack box. If you're in Australia, then the vegan food subscription box from The Vegan Box is the best local option for you. Most vegan monthly subscription boxes are based in the US or UK, but The Vegan Box is Australia-based. The monthly vegan snack box subscription comes with 5-8 snacks, superfoods, lifestyle and skincare products, always vegan and palm oil free. The Vegan Box also offer vegan beauty box subscriptions. They also make great vegan food gifts; just be sure to select the vegan gift boxes option! Click here to find out more information about The Vegan Box vegan delivery boxes. Petit Vour's vegan beauty subscription box is their vegan monthly beauty box offering, and it's my top pick for a vegan makeup monthly box. Petit Vour is the place to go online if you want to find vegan beauty, skincare, makeup and even zero waste makeup. Each Petit Vour beauty box contains $45-60 worth of curated, luxe vegan beauty products (from just $15). Every Petit Vour box contains 4 products and all are vegan, cruelty-free and non-toxic. Products could include beauty or makeup products such as lipstick, mascara, bath oils, soap or face masks. Special Discount: Get 25% OFF your first box with code "theveganword"
Click here for more information on the Petit Vour beauty subscription boxes. 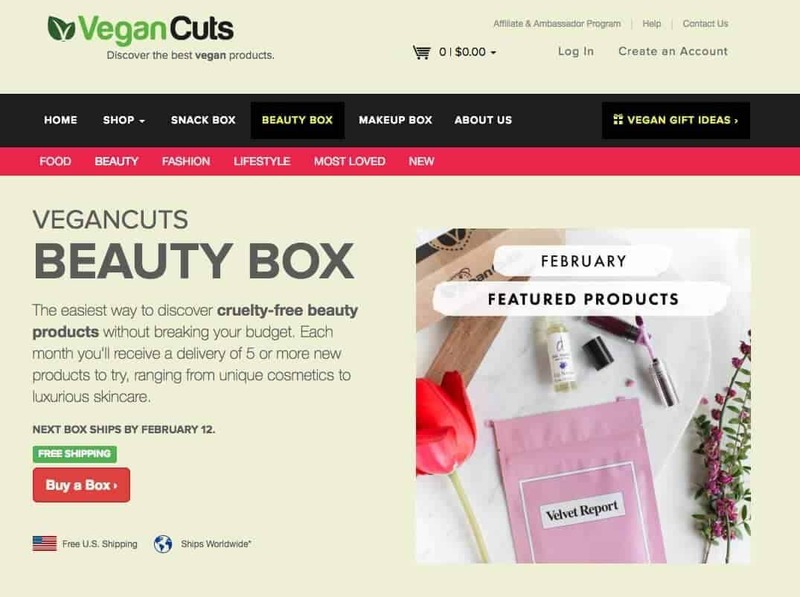 Vegan Cuts' vegan makeup subscription box is a quarterly box containing 4 full-sized cruelty-free vegan products. Each vegan make up box has at least $70 of products. This Vegan Cuts box might contain nail polish or lipstick, and the focus is on natural, organic, parabens and sulfate free products. You can edit your beauty profile to match the colors you want to receive. 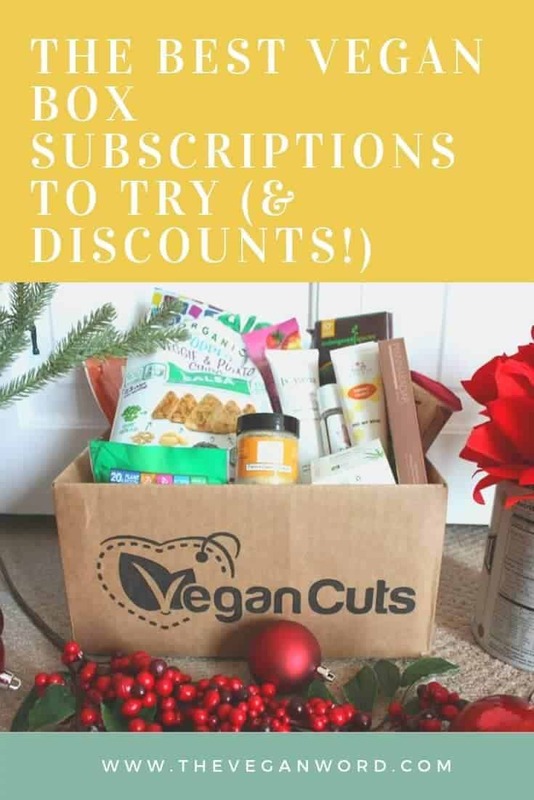 They offer vegan gift box subscriptions if you're looking for a present. 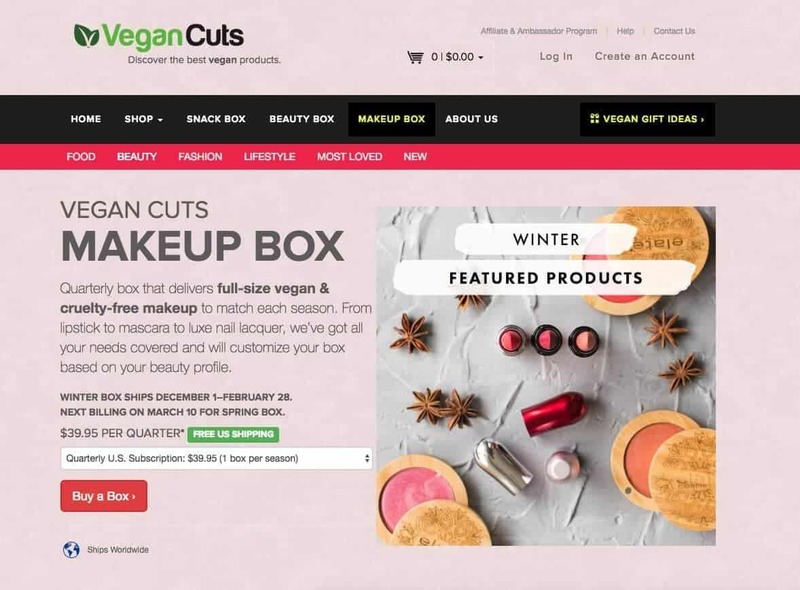 Click here to find out more about the Vegan Cuts makeup box. The Vegan Cuts beauty box is the best way to try vegan skincare and makeup each month. Every monthly box contains 5 or more new products to try, from makeup to skincare. Vegan Cuts is the home of the vegan box. Beauty, makeup and snack boxes are the 3 categories they offer. The beauty box contains $60+ worth of products. If you're looking for a vegan box in Canada, they ship to Canada and internationally for an extra fee. All products are cruelty-free, vegan and parabens-free. 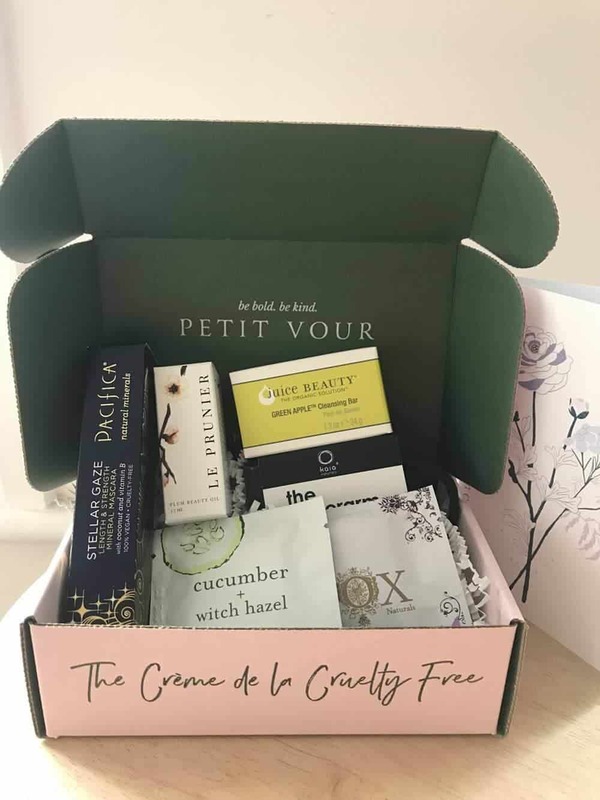 Click here to find out more about the Vegan Cuts beauty box. UK readers don't fear--you can also get a vegan beauty box, The Vegan Kind beauty box. Vegan, cruelty-free products can be found inside each box, which ships every 2 months. The Vegan Kind beauty box might contain moisturiser, eyeliner, cleansing oil or perfume. In addition to all products being vegan, they aim to choose as eco-friendly of products as possible. For every box, The Vegan Kind donates 20p to an animal charity. Click here to find out more about The Vegan Kind beauty box. Shipping: free (USA). Canada + international flat fee. 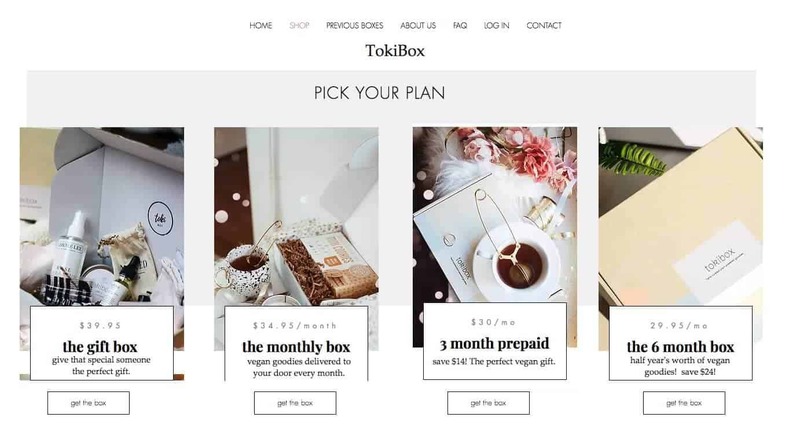 The Tokibox is an all-vegan box focusing on ethical and small brands. Each box is hand curated in NYC and, thanks to their focus on small businesses, likely to contain brands you haven't come across before. Great for discovering new faves. Each box contains 6-8 items from the following categories: skincare, aromatherapy, healthy snacks, superfoods. Click here to find out more information about the Tokibox. Love chocolate? These vegan chocolate boxes are sure to satisfy your sweet tooth. Choose a vegan chocolate gift box option for the best present for the chocoholic in your life. This vegan treat box from Vegan Cuts is full of chocolatey goodness in the form of chocolate bars, cookies, snacks and more. The Vegan Cuts chocolate box features 18 of the best chocolatey vegan goodies! Choose the gift option for vegan gift delivery. 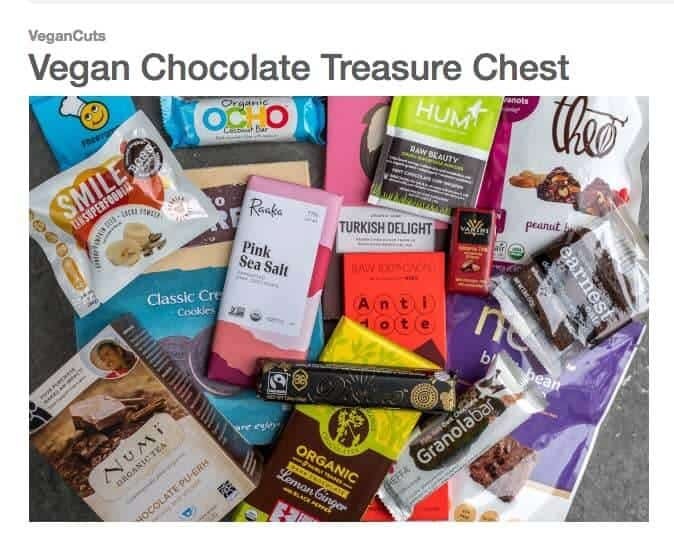 Click here for more information about the Vegan Cuts chocolate treasure box. 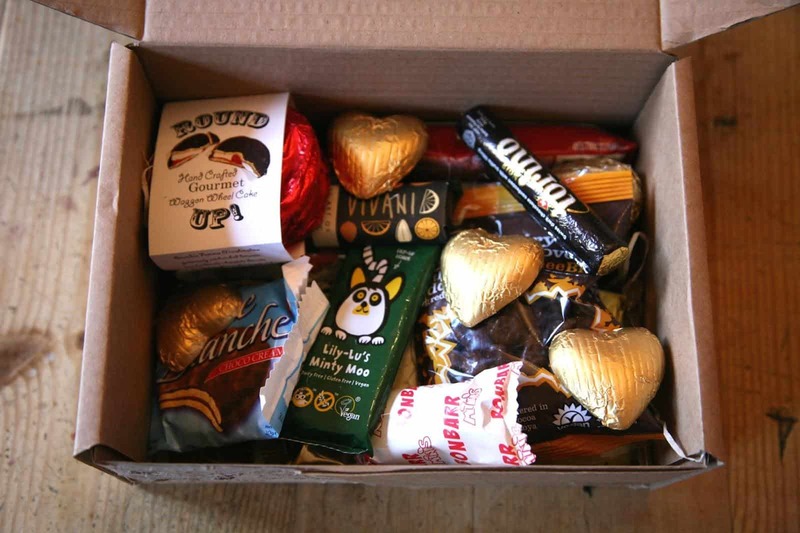 This vegan treats delivery is a vegan goodie box full of chocolates and other treats. Vegan Town is a website dedicated entirely to vegan chocolate and sweets. Each vegan candy box is a surprise assortment of different sweets and chocolates, so you can try new products! These vegan chocolate gift boxes also make the perfect present for a loved one. Click here to find out more about the Vegan Town treat box. Meal boxes can be a great time saver and help you get back in the kitchen. They're divided into two cateogires: recipe boxes (which send you pre-portioned ingredients and recipes you cook yourself) and meal delivery (which sends you pre-made meals, which you only need to re-heat at home). In both cases, they're more expensive than cooking from scratch but you may decide it's worth the savings in time if you're going through a busy period. They also typically create a lot of excess waste in packaging, although one of the options presented below is zero waste. Additionally, one benefit of recipe boxes is they send you only the exact amount of ingredients needed in a recipe, meaning you don't need to run out and buy a whole jar of a spice you won't use again (although I recommend if possible you buy spices from bulk--that way you're using less packaging and just buying the amount you'll use). Veestro is a vegan meal delivery box service that sends you healthy, plant-based (and often organic) meals you only need to reheat and eat. Veestro is one of the only 100% plant-based meal delivery services in the US and has served over 2 million meals. To use Veestro, you select the box size you want (10, 20 or 30 meals) and whether you want a subscription or one-time box. Then, you select which meals you want in the box. On the site, they show pictures of the meals, ingredients, nutrition facts and user ratings. You can also filter by dietary requirements, for example soy free, gluten free, Kosher, high protein or nut free. Discount: get $20 off each of your first 4 boxes for lentil until 3/31 with code "LENTIL"
Click here for more information about Veestro's vegan meal delivery service. The Vegin' Out vegan meal subscription box is for LA, Southern and Northern California and nationwide. Their healthy meals are prepared for you, so all you have to do is heat them up. They use organic where possible. The Vegin' Out food packages come around 9-10 vegan meals per order which most customers say last a week. Each week comes with 3 different entrees, 1 soup, 4 side dishes and a bag of cookies. Each has 3 servings. The menu repeats every 8 weeks so there's plenty of variety in the vegan meal box delivery. Gluten free options on request. Discount: $20 off first order with code "Share20"
Click here for more information on the Vegin' Out vegan meal service. 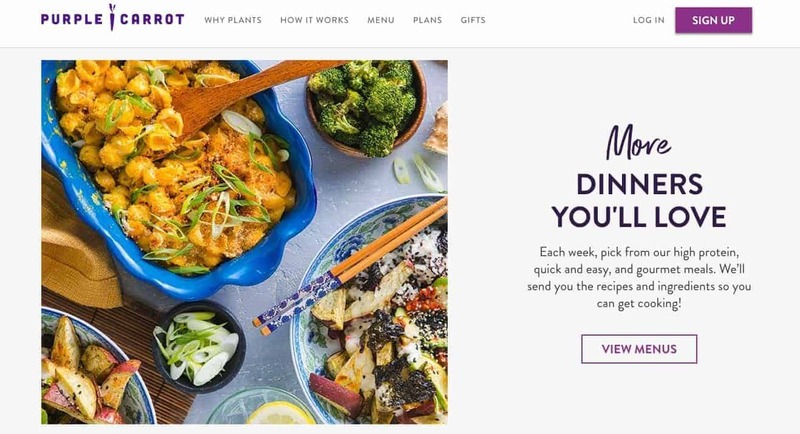 Purple Carrot is a vegan recipe box delivery service. Each vegan food basket contains recipes and pre-portioned ingredients to make the recipes, making it easy for you to get dinners cooked in minutes. Unlike other recipe boxes, Purple Carrot is 100% plant-based. Beyond the vegan dinner box, Purple Carrot Extras are breakfasts and lunches you can prepare in 5 minutes. They try to ensure most of the packaging is reusable, recyclable, biodegradable or composable. With Purple Carrot vegan delivery boxes, you'll receive ingredients for 3 meals each week. Each meal serves 2. You can then add Extras (breakfasts and lunches) if you want. You can choose between Quick & Easy (dishes you can make in 30 minutes or less), Higher Protein or Chef's Choice (gourmet dishes). You can also gift Purple Carrot meals. Discount: $30 off your first subscription with code "carrot30"
Click here for more information on Purple Carrot vegan recipe boxes. 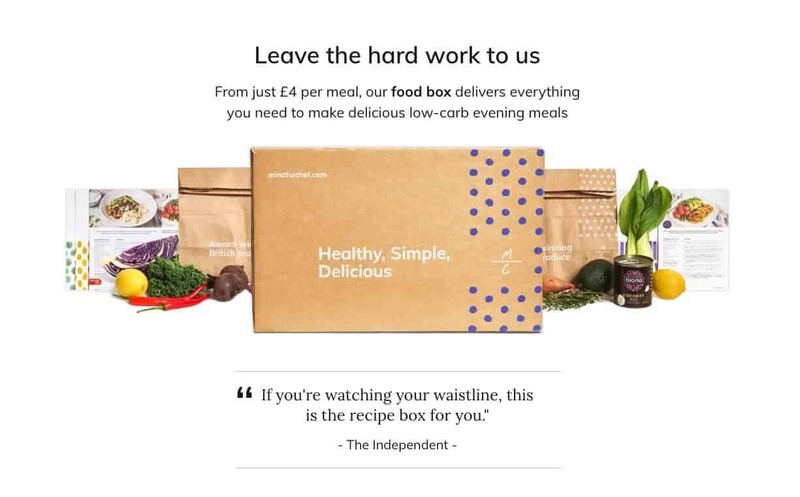 Mindful Chef is a UK-based food box. Vegan meals can be ordered; every week they have at least 4 vegan options. All recipes are nutrionist approved and they never include refined carbs (e.g. white bread or pasta). The meals are based around seasonal vegetables, and for every Mindful Chef meal, they donate one school meal to a child in poverty. Each week, select five meals, including from 15-minute options. Click here for more information on the Mindful Chef recipe subscription box (be sure to select the vegan recipes). AllPlants is a 100% vegan food box subscription in the UK. They deliver vegan meals to your door and all you need to do is reheat them. Select from any 6 meals, designed by chefs and nutritionists, and your meals will be delivered to your door. All you need to do is heat them in the oven or microwave. You can also gift AllPlants meals to friends and family! 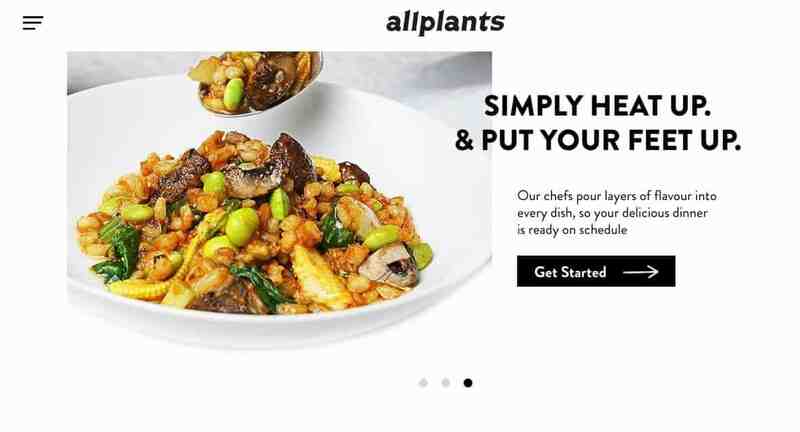 Click here for more information about AllPlants' vegan meal delivery service. The Planted Table is a plastic free, zero waste vegan meal delivery service in the San Francisco area. 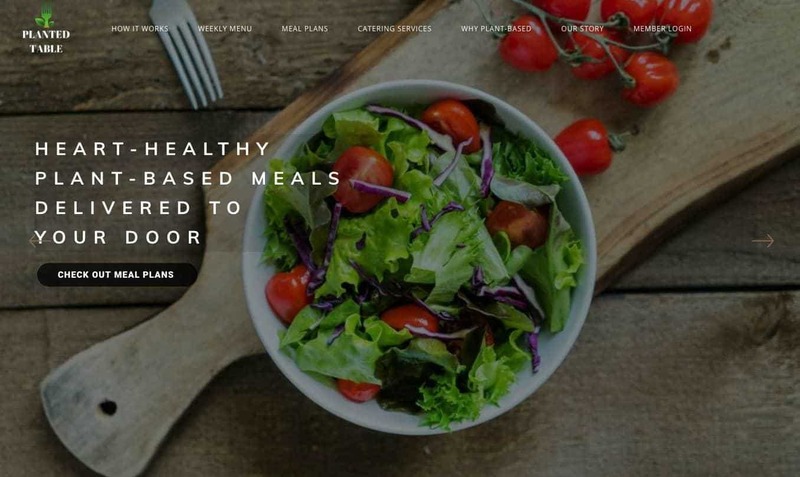 If you live in San Francisco, Alameda or Contra Costa counties, you're eligible for delivery (along with parts of the North Bay and South Bay) -- or you can pick up your meals from The Planted Table's Oakland kitchen. Cleverly avoiding the packaging waste problems facing many vegan box subscription, The Planted Table delivers all meals in reusable glass containers. You can then return the glass containers to The Planted Table the following week for reuse. You can choose between 3-day meal plans and 5-day meal plans. 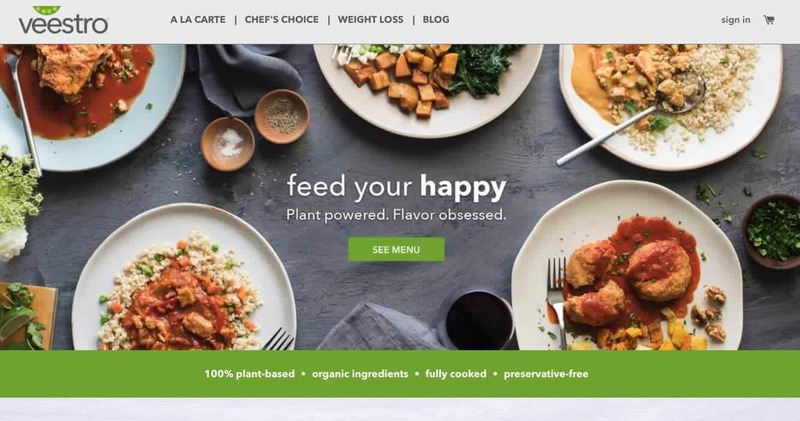 Click here to find out more information about The Planted Table's vegan meal delivery service. Note: This guide contains affiliate links, meaning if you make a purchase through one of these links, I'll make a commission, at absolutely no extra cost to you. This support helps me maintain my blog. Thank you for your support!